The Darien YMCA girls and boys gymnastics teams are back in action, competing in meets across the state in recent weeks. 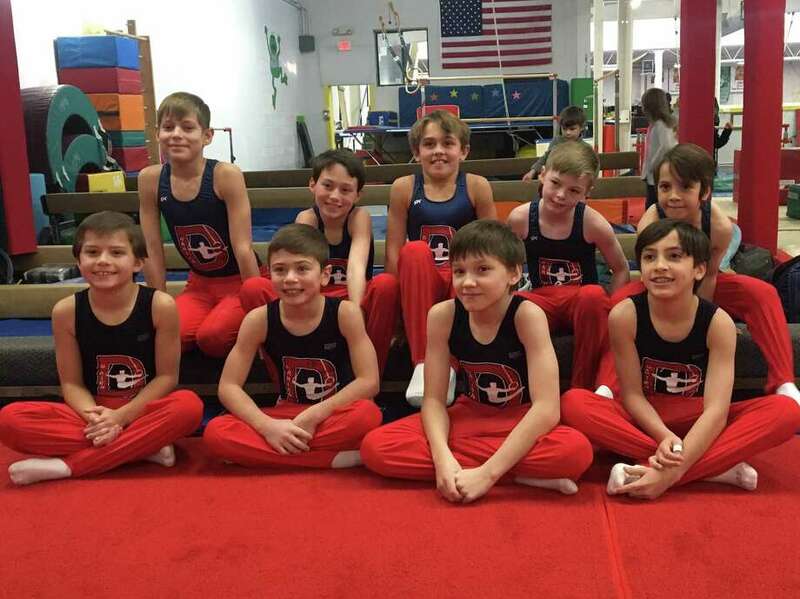 The boys Level 4 and 5 gymnasts began their season at the Gymnastics Training Center meet in Simsbury. Competing in their first meet, the Level 4 division 1 gymnasts were led by Derin Leon who took first place on five events in the 7-8 age group, including scoring 10.20 on floor and 57.20 All Around (AA). George Callahan swung to first on parallel bars (p-bars) and pommel horse according to a press release. In the 9-10 group, Max Kagel captured first on six events, highlighted by a 9.7 on pommel and took second on floor. Jake Simon earned second on all events except vault where he placed third. As the sole competitor in the 11 and up group, Jackson Lawrence hit stand out routines on floor, rings and bars with 9.8, 9.4 and 9.5 respectively. Ryland Herzog continued his winning ways in his first Level 5 division 1 meet, placing first on five events in the 9-10 age group including scoring 10.3 on rings, 9.8 on bars and 9.7 on pommel. Ryan Hough topped the podium on vault and high bar with 9.8 and 9.5. In the 11 and up group, Egor Vasilyev captured first on five events including the AA with 56.20 while Nate Smith was tops on both p-bars and high bar. At the USA Gymnastics meet in Watertown, Derin Leon took second on vault and rings and third on vault in the Level 4-1 7-8 years group. Max Kagels was the vault champ in the 9-10 group, took third on floor, pommel and rings and second on high bar and AA. Monty Bell tumbled to the top with 9.8 on floor and was second on p-bars and fourth on high bar. Jackson Lawrence, again the sole 11 and up competitor had highlight routines on rings and high bar with 9.4 and 9.2. Ryland Herzog earned his second AA title for the season in the 9-10 group, and was tops on floor, p-bars, high bar and rings with 10.10 and second on pommel and vault. Ryan Hough vaulted to first and was second on floor, rings and p-bars. In the 11 and up group, Egor Vasilyev and Nate Smith split the titles, with Vasilyev winning on pommel, p-bars and AA while Nate Smith was tops on floor, rings and high bar. At the highly competitive Gym Revolution Team Challenge meet in Danbury, the girls’ team made an impressive showing. The Level 6 gymnasts won the team title and Reilly Costello and Abigail O’Brien won the All-Around (AA) title for their age group and level. With just six gymnasts, the Level 6 squad took first in the tight team competition. Abigail O’Brien set the pace with 37.55 AA in the Senior A group, placing first on every event, including vault where she tied with Kristie Alianiello, who was also second on bars and third on floor and AA. Julia Decsi was the beam champ in the Junior B group with 9.4 as well as fourth on bars, third on vault and second on floor and AA while Lauren Smith was fourth on vault. In the Senior B group, Megan Mitchell placed second on bars, sixth on vault and floor, and fifth AA and on beam where Sommer Schmidt earned seventh. Avery Hanson led the Level 3 team, placing first on floor with 9.325, fourth AA and third on bars and beam in the Senior A group. In the Junior A group, Jacquelyn Coppola earned fourth on beam, sixth on floor, seventh AA and eighth on bars. Violet Peroni placed eighth on beam and ninth AA. Eve Calio took third on beam, sixth on bars, eighth on floor and fifth AA in the Junior B group. Penelope Hahn was seventh on beam and floor while Courtney Timmeny was sixth on vault. In the Senior B group, Tatum Jaroch topped the podium on floor and was seventh on beam and ninth AA. Emma Bookless took fourth on floor and ninth on vault. Catherine Travaglini was steady for third on beam with 9.525 and sixth on floor. Olivea Rosenbaum was eighth on bars, followed by Rhea Rai in ninth. Hannah Reyna took ninth on floor and Hannah Dudek earned her meet high score on bars. Reilly Costello led the third place Level 4 team, taking first on beam, floor and AA with 37.175 and placing second on vault and third on bars in the Senior B group. Bella Koproski was the vault champ with 9.575 and was second on all other events and AA. Bowen Burns swung to first on bars and was third on all other events. Mia MacDonald was fourth on vault, bars and AA and fifth on beam and floor while Jordan Moss swept sixth place. In the Junior A group, Kayla Koproski earned eighth on vault, seventh on beam, third on floor and fourth on bars and AA. Emily Rizzi was steady for third on beam, fifth AA and sixth on all other events. Olivia Davis vaulted to ninth and was seventh AA and fourth on beam and floor. Ava Telgheder placed seventh on beam and eighth on floor in the Junior B group. Mina Leon topped the beam podium in the Senior A group and was seventh on vault, fourth on floor and second on bars and AA. Stella Nehro flipped to first on floor and placed seventh on bars, second on vault and third on beam and AA. Regan Famigletti took third on floor, sixth on vault and ninth on beam and AA while Madeleine McGivney was ninth on vault and floor. Darien’s only Level 5 gymnasts were Sophie Root, who placed sixth on beam in the Junior B group and Ava Licata, who took fourth on beam and fifth on floor in the Senior A group. Abigail Nevin paced the Level 7 squad, taking third on bars, fifth on beam and second on vault and AA in the Junior B group. Anna Moss never wavered in winning beam with 9.3 and was seventh on vault, sixth on bars and fifth AA. Sofia Ituteri took fifth on vault in the Senior A group. In the Senior B group, Lucy Collins earned seventh on bars and eighth on vault and beam while Lana Schmidt was seventh on vault and eighth on bars. The fourth placed Level 8 team was led by Saskia Chermayeff, who took sixth on vault, second on bars and floor and third on beam and AA in the Junior B group. Leilani Nguyen was fifth on vault and sixth on floor while Bella DeStefano, competing on only two events due to injury, earned ninth on beam. In the Junior A group, Sofia DeStefano was sixth on floor, third on beam and second on all other events and AA. Sarah Cross also competed only two events, earning fifth on both bars and beam. Gymnasts Regan Famigletti, Ava Licata and Sophie Root are from New Canaan.